There has been outstanding issue with the TX output of the mcHF that was discussed in the group and needed fixing. I did a lot of testing and i think i finally have the solution to address it. 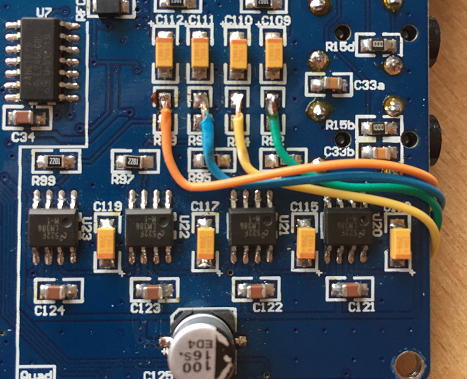 When designing the mcHF RF board all modules had been fine tuned to achieve maximum performance, while the software was more or less good startup reference. Although it was possible to adjust the PA gain and software gain on the TX path, levels were adjusted to achieve a good, clean signal and reasonable power output. But then after the full Open Sourcing of the firmware, features have been added, old ones re-written many times, while performance was pushed to the limit. In a way after three years, the RF board hardware lacked behind the improvements on the firmware. One of the most obvious problems caused by that was ability to overdrive the TX mixer so easily via the software adjustment menu. The problem could be demonstrated by attaching a Spectrum Analyzer to the probe of a dummy load and TX-ing into it from the mcHF. 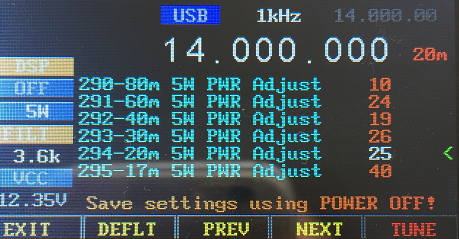 I have set my radio to 14 Mhz, a good middle point of the bands supported, also well into the passband of the filters. 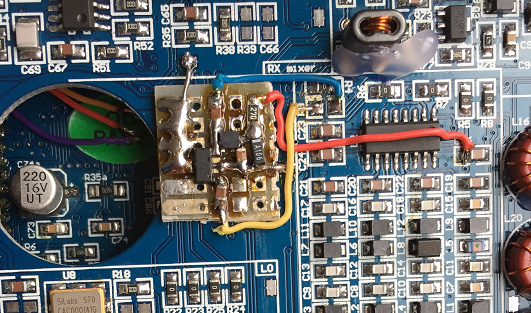 Further investigation is achieved by insulating the stages by input/output jumpers (0 Ohm resistors) and we can determine that the TX mixer should not output more than 3 dBm at the TX_MIX signal(direct measurement in the BPF module, via removal of R2). Quick look at the block diagram pinpoints the problem to the Quad pre-amp. Via empirical means it could be determined that it provides some 10 dB of audio gain which allows to easily overload the mixer if the software gain in the firmware is maxed out. Then just put four wires across to complete the bypass. This off course is a partial solution because the gain of the final PA stage is not uniform in the full range of 3-30 Mhz covered by the mcHF. Although some mods, like transformers (T6,T7) upgrade and fine tuning of the LPFs improve that, simple bypass of the quad pre-amp and loosing 10 dB of gain can result in much lower power output on higher bands (above 18 Mhz). I have played and tested few of those while designing the mcHF. The common problem is those chips are usually designed for GHz application and have ginormous gain at HF. But lately i have found a nice little chip from Analog Devices (formerly Hittite Microwave) that seems to be simple and stable enough for our application. The HMC482ST89 is rated at 20 dB gain, while powered with 6-12 V, bias adjustable, and DC to 5Ghz. 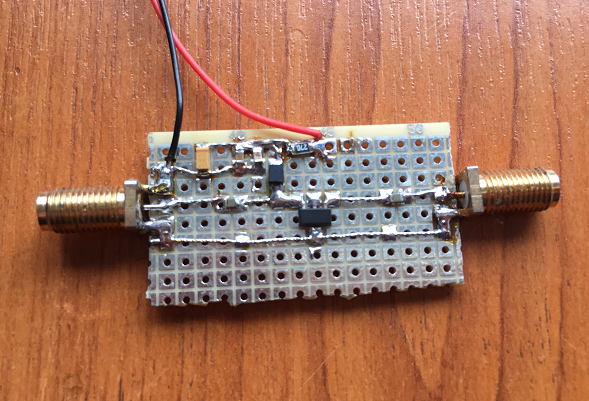 And the first thing was to build a small, prototype board and connect to the Spectrum Analyzer and the RF signal generator. But note that limiting the gain at such a low frequency is not risk free. I have achieved this via careful biasing and 1V under voltage of the minimum pdf requirements for the chip. Otherwise the gain below 1Ghz is uniform 20 dB if following the operating parameters blindly. So the pre-amp connects to the 5V rail on the RF board and i am using 27 Ohm biasing resistor, which gives about 4.20 V supply to pin 3 of the MMIC chip. So where is the best place to insert this new amplifier stage ? Common sense would indicate immediately after the mixer as the stage we have just removed is before the mixer. Also having the BPF filter after the pre-amp would remove unwanted 2nd and 3rd harmonic. But we have to consider clipping and de-biasing of the switches in the BPF with such high RF levels as 3-13 dBm. Another practical consideration was the modification of the PCB for future revisions. In my view the best place is just in front of the PA stage. The power supply (5V) is taken from left side of C26(red wire), and input and output are patched to the R3 pads, while the jumper R3 is removed. Left side of R3 is BPF output(yellow wire), that goes to the pre-amp input and the right side is the final PA input(blue wire) and connects to the pre-amp output(T5 primary, should read 0 Ohm to GND). The actual schematics show the values used to build the small proto PCB. All preliminary testing show that the mod result in quite an improvement on the output TX signal, while providing enough output power in the full frequency range supported by the mcHF, without the need to overdrive the TX mixer. It is a series of attenuators, the high powered one is 20 W, i believe it provides attenuation of about 7 or 10 dB, while the home made one can handle less than a 1W, but is 30 dB. I would welcome if anyone can test this mod, provide feedback, suggestions, etc. As usual, via comment here, to my email (djchrismarc at gmail) or the Yahoo group. Thanks for reading! This entry was posted in Uncategorized on December 18, 2016 by m0nka. Chris, did you use Translate mode when doing your Transmitting tests. My initial findings are that spurs are bad and not really improved if using -12KHz translate mode. With our without the mod, hence my asking what you are using. And with no translate mode, I get very good results with the mods. but AM and FM would not be possible otherwise. Also RX is much cleaner. Right now is compromise i guess. Thanks Chris. At this stage when i did your mod, I could not replicate your improvements in spectrum plots with -12KHz offset (Or others). Which is a bit puzzling. I used a RBW much lower than your setup also, 300Hz to see things better. But if I run with your Mods and no offset then spurs are down >60dB. Compared to my tests last year with zero offset, removing the LM386’s is better. 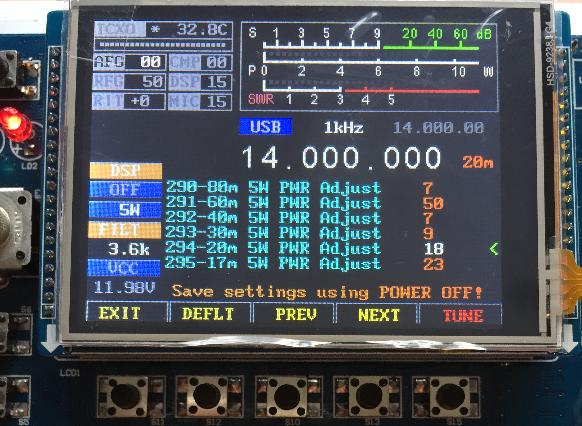 With your mods, my max power out on 20M is about 8W. The setting for 5W out in the menu is around ‘4’. (I amusing fairly old German firmware) Making things a bit on the course side. In Rx mode with zero offset the Rx is indeed not ‘clean’ but with antenna connected that noise I hear disappears. In my opinion the Germans software guys should offer the option of zero offset in Tx mode but revert to -12 or whatever in Rx mode. After asking for this a couple of times last year I gave up. They seem to be keen on adding all sorts of ‘bells and whistles’ but not on changes that could improve RF performance in my view. Do you think you could test your mods and put a plot of the output running with zero offset, please? to school next week. Drop me a mail as reminder please, i will do any measurements you need. OK, thanks Chris, will do. Understand you have other commitments also there. Chris, can you advise what level is present approx at the input to the PA stages, when doing this mod. ie the dBm available to drive the MMIC stage. Sorry for the late reply, there should be about 3 dBm at the input of the PA module. Thanks Chris, I am getting ~0dBm and using a Mini-Circuits GVA-81 MMIC in my mod.. This gives approx. 12dB gain running at 5v and no resistor. (approx 100mA though!) 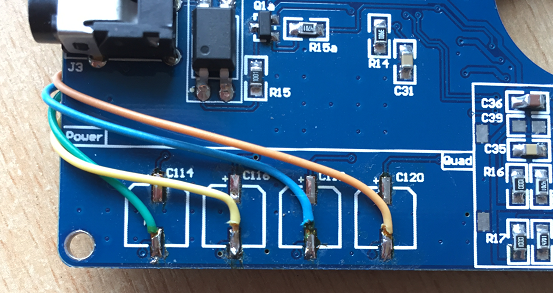 I am using a 100uH SMD choke in the output side with a resistance of ~4R. Due to lack of space near the speaker, I made a little PCB which mounts on the heatsink bar with two screws. Chris, I have now built up a little PCB with the only device i have that comes close. I used an ERA-1 MMIC. 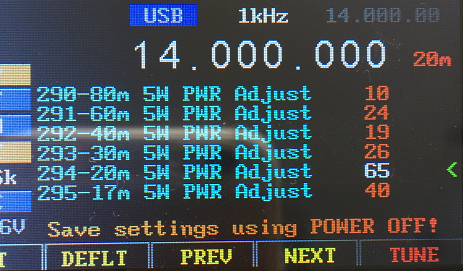 This only has an output P1dB though of ~+12dBm. 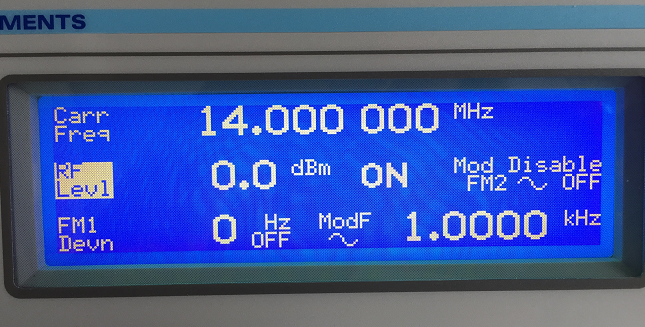 A gain of 12dB measured at HF. Approx 35mA consumption. What sort of level is there at the point of insertion with your amp? By the way the device you used comes up as obsolete. I made my PCB a little longer with mounting holes at each end in order to fasten to the heatsink bar. There is no room in your position, with speaker i used to fit as you suggest. Mmmm, in my build there is no space to fit that amp, as the loudspeaker interefers with it, so can’t do any test for you at present. 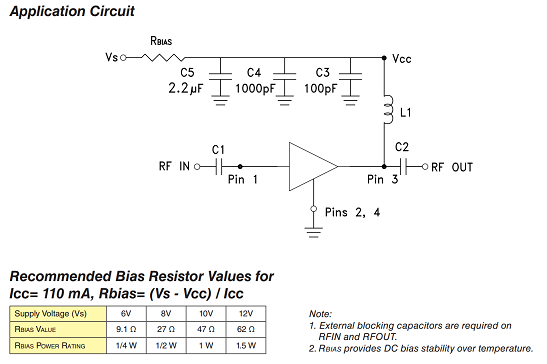 It is possible though to decrease the value of the R93, 95, 97, 99 resistors from their current 2k2 value to ~750R to give unity gain through from the TLV2464 stage, to out of the LM386’s. Fitting a 1k resistor in parallel with the 2k2 should be close enough. Leave the LM386’s in circuit. However this is probably not a great ‘fix’ as I would assume the noise levels may be increased. that should be a 1k2 in parallel. I don’t have the MMIC you suggest, but do have an ERA-1 device offering 12dB gain (@100MHz) I might try this week and report back. sorry, missed the start of the page…. don’t bother to answer this or my previous post! Do you have a larger picture of the Schematic? It’s a bit hard to read the values used etc. Is in necessary to remove the 4 quad amps?? or just bypass them? You can simply bypass, or remove the components. It is up to you. that is a great step forward! Getting rid of the LM386 drivers will improve phase noise by about 20 dB. Could you also show the spectrum with a more narrow bandwidth, 300HZ or 1 kHz, span about 20..50 kHz, and the 10m band? Thus we could see the carrier supression, sideband rejection and evtl. other close-in spurious signals. I wonder if the TX also had improved these. 20, the phase noise is negligible as it is. so you are proposing to get rid off all 4 386s with surrounding elem\ents, right? Interesting stuff, will you make any add on boards for the previous revisions? like to be up to date with mods etc. Without having any hands on experience actually using mine is this a big issue? No add on board, it has to be similar to the way i have done the mod. Are you going to reorder your RF board with that changes applied? After enough testing and proved worthwhile, eventually all mods end up in new revision PCBs.